Through a randomized, double-blind, placebo-controlled phase II clinical trial, researchers at University of California San Diego School of Medicine report that small doses of NGM282, a non-tumorigenic variant of an endocrine gastrointestinal hormone, can significantly and rapidly decrease liver fat content in patients with non-alcoholic fatty liver disease (NAFLD) and nonalcoholic steatohepatitis (NASH). The findings, they say, represent an important proof-of-concept for the compound as there are currently no Food and Drug Administration-approved treatments for NAFLD and NASH. The study is published in the March 5 online issue of The Lancet. "Patients with NAFLD and NASH have had limited treatment options for years. 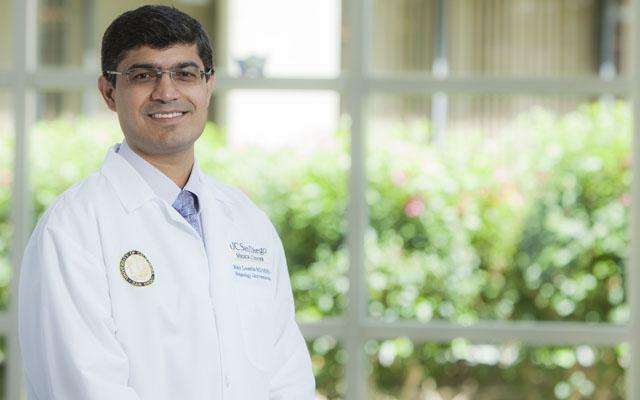 What the results of our phase II study show is a promising future where NGM282 may be able to provide relief to these patients," said senior author Rohit Loomba, MD, director of the UC San Diego NAFLD Research Center and director of hepatology at UC San Diego School of Medicine. NAFLD includes a spectrum of chronic hepatic (liver) diseases, with NASH being the most aggressive type. The cause of both NAFLD and NASH remains a mystery, but certain health conditions, including obesity and type 2 diabetes, can be predisposing factors. It is estimated that tens of millions of people globally are living with NAFLD and NASH. Weight loss and a healthier diet are the current standards of care. The study involved 166 patients, ages 18 to 75, at 18 different hospitals, gastroenterology or liver clinics in the United States and Australia. Participants had confirmed NAFLD or NASH biopsies and a liver fat content of at least 8 percent. Participants were randomly assigned by a web-based computer system on a 1:1:1 model to receive 3 milligrams (mg) or 6 mg of NGM282 or a placebo injection once per day. They were then monitored biweekly over a three-month period. Loomba explained that both the 3 mg and 6 mg doses of NGM282 produced rapid and sustained change of liver fat content. "The most promising outcome of this study was the absolute change in liver fat that we were able to measure using advanced magnetic resonance imaging (MRI) methods previously developed and validated in pilot studies conducted at the UC San Diego NAFLD Research Center. Looking from baseline to week 12, we consider participants who had a liver fat reduction of at least either a 5 percent absolute reduction or greater than 30 percent relative reduction from baseline to be clinically significant." To measure reduction in liver fat, researchers used hepatic MRIs with proton density fat fraction. This type of imaging is extremely sensitive to changes in liver composition compared with traditional assessments of tissue samples under a microscope. NMG282 is a non-tumorigenic variant of fibroblast growth factor 19, an endocrine gastrointestinal hormone that regulates stomach acid and is responsible for glucose and lipid metabolism in the body. It is suspected that NMG282 is able to improve liver steatosis as well as inflammation and fibrosis commonly associated with NAFLD and NASH. Study participants generally tolerated NMG282 with reported side effects including pain at the injection site, diarrhea, abdominal pain and nausea. No life-threating events or patient deaths occurred during the study. The authors said additional and longer trials are needed to fully understand the efficacy and effectiveness of NGM282. "Moving forward, we are continuing the development of this compound for the treatment of NASH related fibrosis," said Loomba. "In this, we hope to further examine the efficacy of this hormone in improving liver histology based end-points in patients with biopsy-proven NASH with fibrosis." Co-authors include: Stephen A. Harrison, MD, University of Oxford; Mary E. Rinella, MD, Northwestern University; Manal F. Abdelmalek, MD, Duke University; James F. Trotter, MD, Texas Digestive Disease Consultants; Angelo H. Paredes, MD, Brooke Army Medical Center; Hays L. Arnold, MD, Gastroenterology Consultants of San Antonio; Marcelo Kugelmas, MD, South Denver Gastroenterology; Mustafa R. Bashir, MD, Duke University Medical Center; Mark J. Jaros, MD, Summit Analytical; Lei Ling, PhD, Stephen J. Rossi, MD, and Alex M. DePaoli, MD, NGM Biopharmaceuticals, Inc.
Disclosure: Loomba is a member of the clinical advisory committee for this trial for NGM.